We are sent round the world once again, in hopes of collecting art, buildings and artifacts relating to some of the finest artistic capitals in the world (sorry Australia). 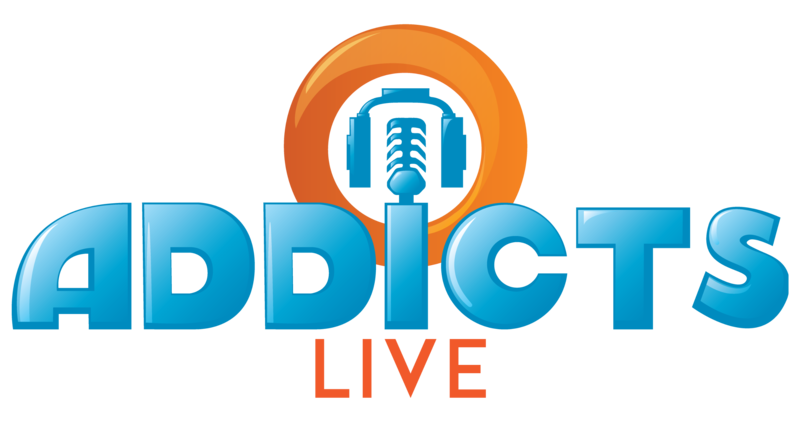 There are a TON of items to be won and crafted, and we are here to cover some of the benefits for winning them, which can linger long after the event is over! 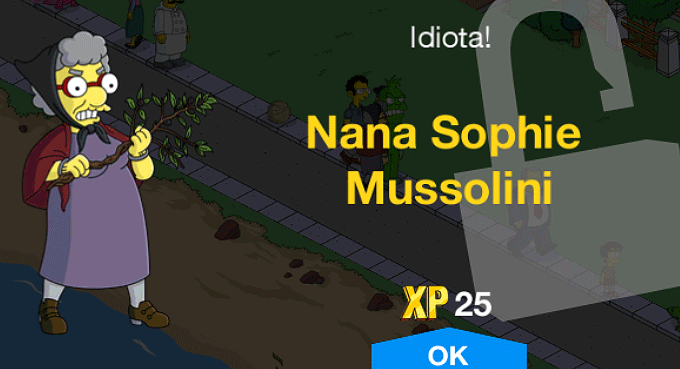 The 7th Prize to be awarded for Act 1, Nana Sophie Mussolini (Milhouse’s Grandma)! Let’s face it…if you have any Italian friends, especially if you are in the “baby boomer” age group, you know someone like Grandma Mussolini…aka Nana Sophie. I knew a bunch of them…and they all scared me to death. One of my best friends was of Italian descent…and an amazing guitar player with a very complicated family(there were implications of connections with other families, but it was never discussed)…including a grandma who often would give someone the “evil eye” if she didn’t like them. I’m not going to say that bad stuff actually happened with this well-known Italian curse…but, I never wanted to take the chance. I was always on my best behavior around her. It just made sense. 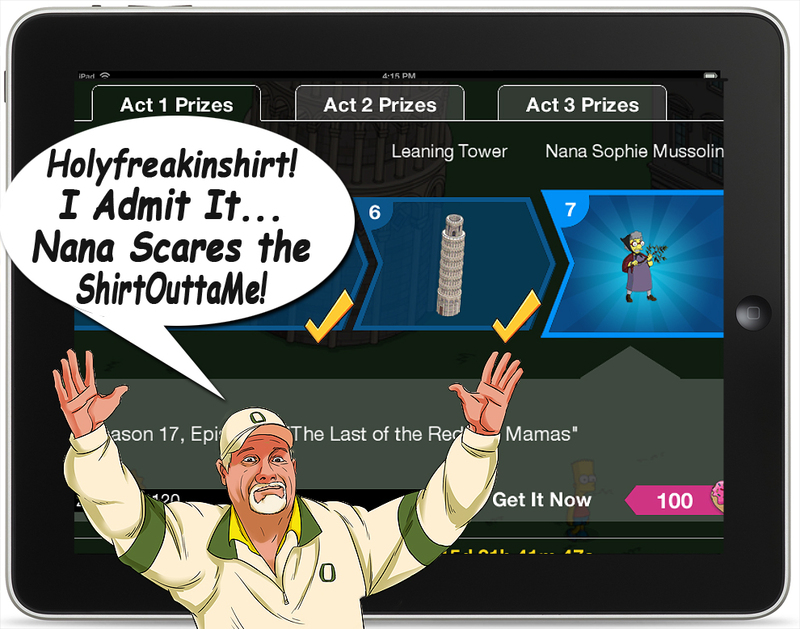 She is a hilarious character in our game…but you REALLY have to Grind for her…as in 40,120 Paintings… YIKES!!! And she doesn’t even earn Event Currency! But, you can yell all you want, unless you are yelling in Italian, she won’t listen. She is a grandma…pay her some respect…or you’ll be on the receiving end of a switch! Kirk:Good news, Milhouse. Your Italian Nana is coming to visit. Milhouse: How is that good? She thinks I’m an idiot. Kirk: Aw, just talk to her in Italian. You did learn Italian, right? 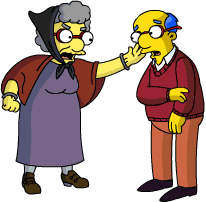 Kirk: Nana, I think you should tone down your lessons with Milhouse. Whenever you show up he hides underneath the dryer. As head of the family, I must insist. Kirk: Oh, thank god, Luann’s here. You must help us. 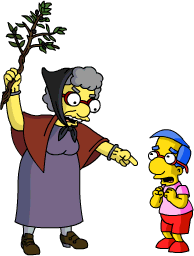 Milhouse: Nana’s gone rogue. She’s totally humiliating us. Can you talk to her?Luann:Of course. Nana, you want to stay another week? And that’s it…one badass grandma. who refuses to speaka, da. language…and would rather take a switch or a backhand to anyone who doesn’t respect the old country or the old ways. OK then… Sooooooo glad I got her! And now…more grinding, more collecting…more stockpiling to get ready for Act II!! 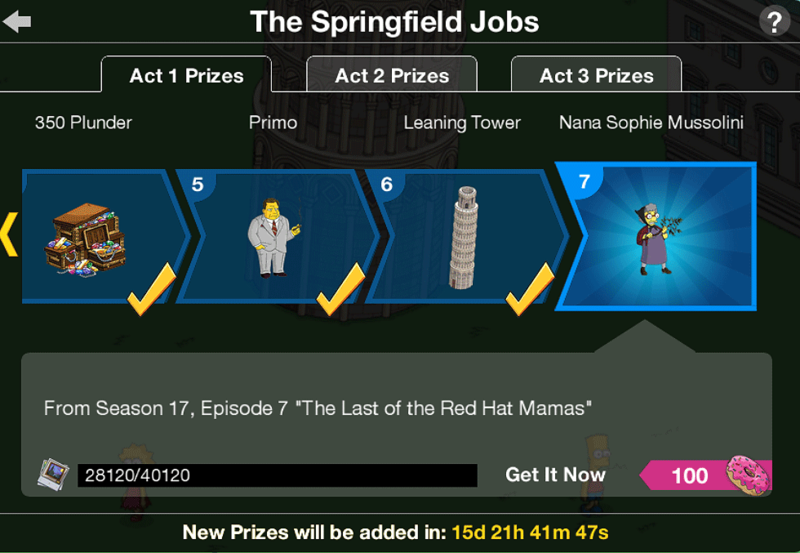 This entry was posted in Tapped Out and tagged Nana Sophie Questline, Nana Sophie Tasks, Tapped Out Tips and Tricks, The Simpsons, The Simpsons Tapped Out, TSTO, TSTO Addicts, TSTO Nana Sophie, TSTO Springfield Jobs Prize Guide, TSTO Tips and Tricks. Bookmark the permalink. P.s. when i called the first time the day after the glitch i got an uneducated person who just sent me the standard ” try these things to fix your game email.” The second time they told me many people had it and the rollback didn’t fix the problem and to wait for the miraculous fix that will happen “sometime, someday”. Meanwhile, the game has lost a fair bit of my enthusiasm as i play a broken game. I’m very disappointed. They’ve been knowledgeable and helpful in the past. How many donuts is too much to pay for her? I might come up a little short this act, but I’ll drop a dozen or so donuts on a character if I need to. Got her days ago in my premium A game, but will probably miss her in my B game. Mostly due to the fact that I was really sick with the flu for two weeks, and couldn’t even find the energy to tap regularly. Plus, the thought of keeping up with more than one town for the ridiculously long time this event is running kind of put me off right at the start. Why do they all look like Mulhouse? 5k to go, and 34 hours to go! Lets go! I wonder why they went with Nana. They should have called her Nonna, the real Italian word for Grandma. Every Italian grandmother I know goes by Nonna. Unlocked Nana this morning. She is very cool! A little disappointed her outdoor tasks are stationary. I was hoping she would chase Millhouse around town. Also a little disappointed with Shary Bobbins flying task. I was expecting her to fly around the streets or fly overhead like Arnie Pie. But she just floats in one spot. Ah well, awesome to have them both in my Springfield. There is an advantage to keeping Shary in one place…you can easily keep her in the air forever. That’s what I do. Not a fan…I have her…she floats. Forever. I am just under 3000 Pictures of Paintings away from getting Nana Sophie Mussolini and I really hope I can get her tomorrow evening so that I can have at least 2 daily challenges saved up for Act 2. I like that Nana has most of her indoor tasks in a location other than the Brown House because whenever a character has all or most of their indoor tasks at the Brown House it makes me think that EA believe that they can’t use any other location for their tasks (Calabresis’, Primo, Gabbo and Arthur for example). 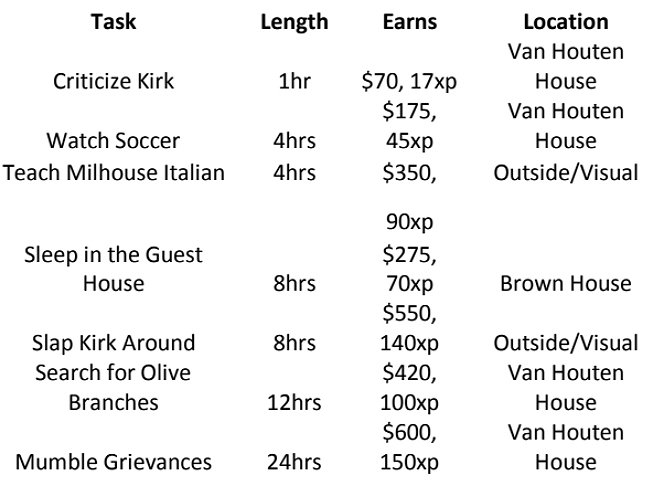 I also like that her 4 and 8 hour joint tasks with Kirk and Milhouse have their own solo 4 and 8 hour versions in case the Unemployment Office is used. Poor Milhouse he never had a chance..
Have you tried to remove the game and reinstall it? It looks to me a gamefile is corrupt.. Still have the rollback glitch and EA isn’t answering emails after refusing to roll it back again. I’m in “we’re working on it” land going on nearly a month. It’ll be the first time I haven’t finished every aspect of an event since I started playing before Whacking Day. Has anyone had the rollback glitch actually fixed? I’ve now had the glitch occur twice in a little under two weeks. Both times I could get an immediate rollback to the day before the corruption hit while on the phone with them. After this experience of two phone incidents vs. various email tickets over the past years, I’ll likely never bother using the email route again: immediate vs. 72h response, local agents instead of poorly trained, outsourced agents. Just got the roll back glitch. Nooooooo 😥 Am I gonna lose Nana she is hilarious?! Did you get the glitch before or after you got Nana? If it was after you shouldn’t. After, fingers crossed. I have contacted EA but no reply as yet, do you all the progress I am making now is a waste of time? If you want to do a rollback (I’ve heard rumors that a patch will be coming to fix that so you could wait if you choose), you will want to call EA and get it done now. That way, if you lose progress you will have all of tomorrow to regain Nana. Just curious, do I need to spend all my “Plunder” now or will it carry over to Act 2? Carries over… save it up. Wait spending it. You can use it all the act. I am no longer regretting that I can’t get Nana thanks to all the delays updating. She scares me, too. Thanks! Fwiw, I played as freemium, thinking I would be in a place with no internet for a few days. Turns out I had a little, allowing me to play about 2x a day. I have about 2k to go to get Nana and will probably get her. Down to 30 donuts needed to get her with 2 days to go. Ok, am I missing something? I’m a semi-premium player, I only buy donuts for characters that I REALLY want. Thus I got the Pope and also got Sven. Meaning I have premium characters working on the event for me. I also regularly check in, even sometimes waking up to refresh the timer. And yet I’m still probably only gonna get Nana tomorrow with a day left, yet I see many have gotten her days in advance. My musuem is at full percentage and I visit plenty of people from these forums. How do you guys finish so quickly? You’re getting her, that’s the important part. It’s designed to finish just before the event ends. The more premiums you have the quicker you’ll finish. Yes, I had no premiums & just picked up Mama early this morning. Like her a lot & now looking forward to seeing what Act 2 brings. Another quick reminder…if you are done with the prize track, save those daily tasks till act 2. Complete the tasks, just don’t cash them in till after act 2 starts😁. Oh man, thanks for the reminder!, I totally blitzed on that! Will have to save tomorrow’s task since I already cashed in the one for today. Huh. Pretty disappointing that she only has joint tasks. Cool concept though. Exactly. Pretty much doesn’t even have visual tasks imo. At least they gave her alternate 4- and 8-hr tasks! All unlocked with over 2 days to spare and got to say I am a little bored already, good to see characters rather than skins but now I am grinding for plunder, joy. I just got her. Yesssss! I thought i wouldnt make it. I’m a freemium player so i had no extra help with heists. I even had an easter no-internet weekend and nightly 7-hour sleep. But i think what helped is that i had two daily challenges that were not played (i didnt like the prizes, i.e. 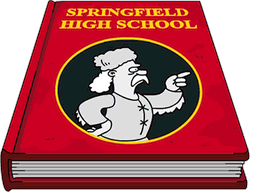 springfield height lattes and pills). I wanted to play for donuts but then the new event came so i got loads of paintings straight away. so i think that was what helped a lot. It was easy to be able to get the 20% bonus with the crafting. 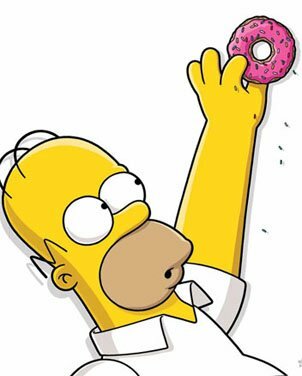 I am always donut-challenged but i just wanted to share that as a freemium player, events are doable. Merry, I love your name!!! Nana looks my maternal grandmother. I couldn’t understand what she said because of her dialect. You might have to explain to the millennials what a switch is. You and I know what it is. Our generation grew up with that punishment mindset. The worst though…when you had to get your own switch. Luckily for me my mom didn’t use them. I’m technically a millennial (in age range only ..I certainly don’t act like one) and I know what a switch is. My Slovak mama whooped us with the good ol’ wooden spoon. Ahhhh memories! Mom used a Rubber spatula. The one mom used to mix cookie dough. Even today, I prefer to have my fanny firmly buried/ protected in a chair while I eat a cookie. I too wish city hall and the unemployment office were a little more customizable, but they still beat finding, tapping, and assigning jobs to every character one at a time. Who remembers? The AI is at least smart enough to use joint tasks if they are the only tasks of a given length a character has (Stampy/Bart’s 12 hour for example). It could have been so simple… if only (for the UO task lengths) the last manually assigned e.g. 8h-task, including skin and joint partner, could be stored for each character. So it would be possible for one character with different skins and/or different joint tasks (maybe for each of the skins) to have a fixed behaviour for each selected time interval. When I select 12h in UO Bart & Stompy will ride together (if I selected this joint task before), 4h and Daredevil Bart does skateboard tricks again. This would also make the ‘send Springfielders to…’ tasks less harassing since the formerly assigned skins, jobs and partners will automagically be reactivated when doing the next 4h, 8h or 12h etc. round. I’m just below 4k to get her now. There is still just over a day to get her because the act doesn’t change over until Friday 2pm GMT (depending on your time zone).